first, thanks for all of the sweet comments on my 32 weeks post! they definitely made my day. now on to business. a very generous friend* of mine passed this book on to me and i thought i’d pay it forward to the next lucky person. this book has lots of good information in it and is a very interesting read. and it’s the only one of it’s kind. so if you’re interested in stepping up and being a designer yourself, if you’re just vaguely interested in the process of what it takes, or if you just want to read the interviews, comment on this post! you can read amazon reviews here. you have until thursday evening at 10 eastern time to comment. i’ll use a random number generator to pick a winner. p.s. all that said about this guide, i still am a total slacker designer who follows little to none of these very good suggestions. p.p.s. and speaking of breaking rules, i’ve been knitting simple things. the wrist braces are great. the project i really want to get done? lace. can’t do that. but i can knit! hurrah! This entry was posted in cosyknitsliterally, designing, free, knitting by cosymakes. Bookmark the permalink. I’m very intrested in being a designer. This is one of the books I have been eying for some time now. Now that I am (finally) graduating, it seems like a good time to figure out how to design my own projects. Sounds like just what I need. Here’s to good chance! I’m very interested. I have a dream of chucking it all and being a knitwear designer and yoga teacher. Here’s to dreams. Would love to win this give-away. I dream of being a designer, but sadly, would probably need to give up my day-job! I’d just like to design a few things for my daughter…the ideas are in my head but I’m not really sure of how to go about getting it on the needles! What a great idea for a book. O i remember seeing this booking, lusting over it & then forgetting all about it. Thank you for reminding me! i am interested in the design process also. love your designs, would love this book!! Congratulations on your pregnancy! I’m very happy for you!!! Yay!!! So into this, I’m commenting from my phone! P.S. What’s up pgh! i’d love to be entered into this drawing. <3 I've been on a huge cardigan kick, and i'd love to learn how to make my own. Thank you for the opportunity! This would be quite a useful book. Thank you for the giveaway. I’ve heard this is a useful and interesting book. Thanks for the giveaway! This book looks awesome. Thanks for doing a giveaway! Knitwear design?! Skinny dipping?! Holla! You look beautiful, btw, mamalady. Can’t wait to blow that babe some kisses via the Intertubes. Have designed a few things but never published a pattern… very curious to read this ! always interested in a good read! I’ve love to design but, sadly, am still waiting for inspiration to strike. I think I’d be good at tech editing, though, so this book still interests me. Thanks for the giveaway (and I love the new tee)! Wow, this looks like a very handy book! oh that book looks great! thanks for the chance to win! 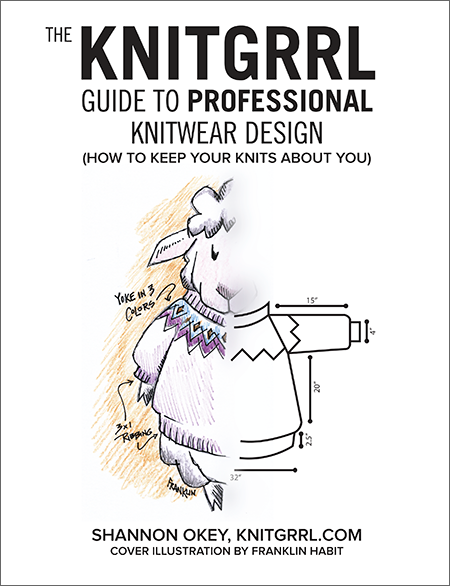 I have heard really great things about the technical insight and tips this book offers. Awesome give away BabyMama! I am pretty good at “improving” patterns but am at a loss when it comes to designing from scratch. i NEED this book. Thanks for the chance to win. I’ve heard about this book but your post is my first glimpse of it so count me in. And congratulations on spring arriving in PA. It was snowing this morning when I was walking back from taking my son to school. Sigh. I have always been interested in designing my own knitwear but feel as though I don’t have the proper knowledge to do so. I think this might be what I need to get started. I would love to be entered in this drawing. So far, I’ve just done modifications, would appreciate advice on how to go from there to design. Also wanted to say that I saw your comment that you want to start knitting lace, I had trouble beginning lace and, after I failed on a few patterns, my daughter had great advice/insight on helping me chose easy, complete-able patterns, so write to me if you’d like me to pass on her advice. I am currently knitting a lace shawl with the beautiful hand dyed I bought from you at the Pittsbugh Handmade Arcade, it’s a light green. The pattern I’m using is Photosynthesis, the yarn is really, really pretty for it, it’s beautifully dyed! So many ideas, so little knowledge! Booked Arrived ! I will be doing a review later today, it looks amazing Ms. Cosy. Everything I heard seems to be true to form. Thank you for the great giveaway!